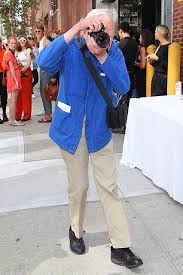 Now that I've retired, I've gradually lost the rhythm of the week: the reveille rat-tat of Monday, the downhill slope of Thursday, the melancholy late Friday afternoons when I wanted to leave, but an extra hour or two would leave the work in good shape for the inevitable... Monday. I can feel the progression still, especially the fizz of Friday, when each rider on the bus seems eager, arms full of weekend treats, phones buzzing with plans. 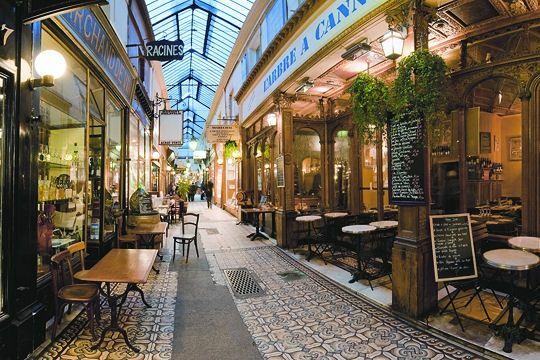 "Bon weekend", everyone says when I shop. People dress a little more cheerfully then, perhaps going out after work, or just relieved to have mustered another week. At twilight, restaurant terrasses beckon, houses warm with cooking, menorahs glow, two-fours clatter into the fridge, men hoist cuboid toddlers out of car seats. Passing me arm in arm, a seventy-something woman asks her friend, "Shall we eat before or after the play?" Whether you spend your day in an office or not, an easy dress signals palpable relief and enjoyment, and skips out after a long week with singular grace. Kate Spade "Chessa" knit shirtdress, $388 at Nordstrom. 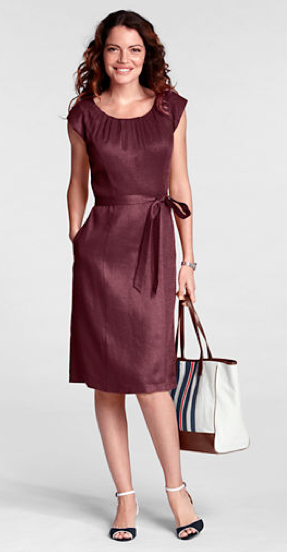 Shirred linen sheath in merlot, Land's End, $110 (in Petite and Plus, too). 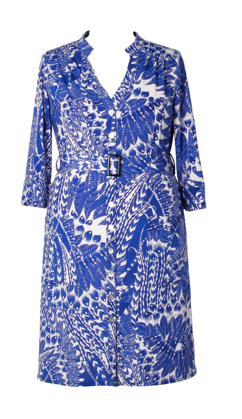 Elie Tahari navy Tess Dress with trapunto-detail belt, $348. One last dress. I'm entranced, and admit it implies an arty office from which to to exit, or perhaps one's Alfa. 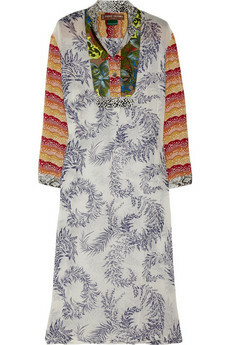 College printed georgette shirt dress by Duro Olowu, $1,580. Love your writing as you introduce this post, the concept of Fridays . . . Thought of you a few times today -- first, getting a new bed into our ParisAddress apt (believe me, it was necessary, old one completement cassé! second, visited Bompard to check out a navy v-neck pullover. Both of those were recommendations from you backaways -- more evidence of how our blogging friends enrich our lives. Thanks! Wow, I love that Land's End dress! materfamilias: Oh no, a broken bed is serious. Hope it was efficiently resolved. rb: All these dresses suit pearls- and your necklace is exquisite! While none of these are really my style, I do think you've captured that "easing into the weekend" vibe quite well! Love the Land's End dress too. 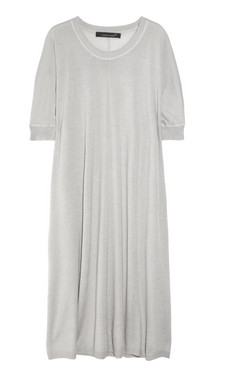 I'm mostly retired, so don't need work clothes, but have been thinking lately about some cool, loose fitting linen dresses for casual wear. Since I live in Houston, our brutally hot summer is now ramping up, and it's a real challenge to dress stylishly when it's always 95 degrees & humid. Especially if you are "of a certain age" and want to cover certain body parts! Jill Ann: Land's End have entered the gently-priced dress market assertively this year and many of them look good for casual wear. A dress is much cooler than pants (and more forgiving than shorts) in that heat, which I knew well when I had family in Houston. I want that Tahari dress! 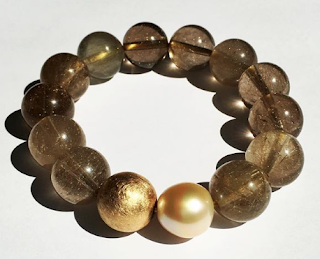 It's so much like the Lela Rose I'm wearing! Except navy! Lisa: I do that too, which is why some of my dresses are near-copies of others. If you find a shape that works for you, stick to it! QE 2 allegedly has multiple copies of the same dress made in different fabrics for different seasons. What irks me is that when you find a nice dress in a summery fabric, it's almost always lined. What's the point of that? Grrrrr. sisty; I believe HRH favours coatdresses. Agree about the lining, and it is always poly/acetate. I've seen linen dresses lined with it- talk abut stupid! That Land's End dress looks surprisingly nice for the price. Will take another look at that website. It, like LLBean, is one of the easier US websites to order from in Canada. lagatta: Once in awhile, they offer free shipping, too. Worth signing up to get their e-mails so you know when. Pretty dresses! and I love that "easing into the weekend vibe". I keep seeing lovely Tahari dresses this spring and drooling over them. Unfortunately they are all cut too short for me.